Crossing Praza do Toural, and continuing along its Cantón, we will come across the shopwindow of Ultramarinos Carro. These shops are called “ultramarinos coloniales,” or simply “ultramarinos,” in reference to the times when they sold exotic products from “ultramar” (overseas), which were canned to keep longer. 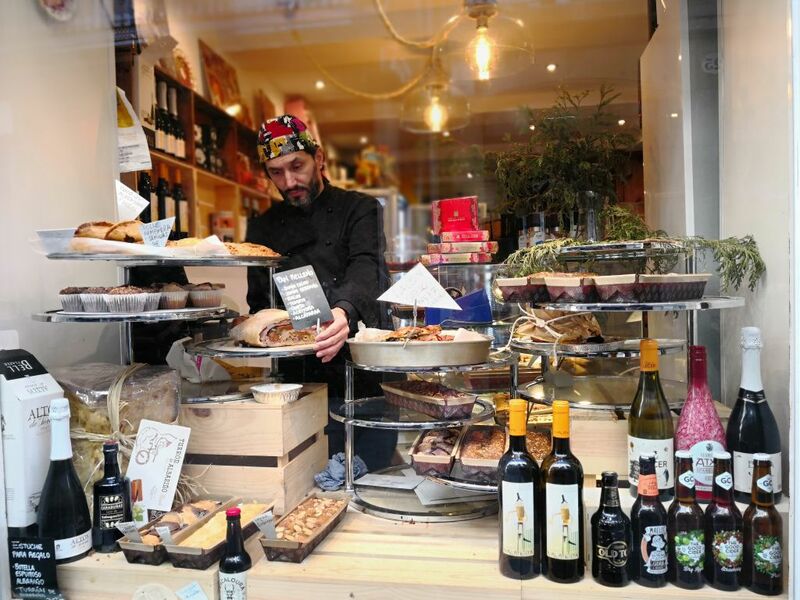 They are now a bastion of fine Galician gastronomy: their shelves feature a mix of cheeses, Galician wines, eau-de-vies, chorizos, canned or dehydrated turnip tops, canned Galician fish and seafood, canned or dried seaweed and even canned nettles produced in Galicia. Of Galician cheeses, the most famous is the tender “queso de tetilla,” which stands out due to its curious cone shape. We can identify San Simón da Costa by its bullet shape and smoky aroma, and the greasy “queso de O Cebreiro” by its chef’s-hat shape. The fourth variety is the creamy Arzúa-Ulloa, a first-class dessert when eaten with quince and bread. Although not cured, Galician cheeses keep well. Ideal for taking home! We will find more establishments like this one by turning towards Rúa das Orfas and Caldeirería. One example is Recouso, where Compostela’s artisanal chocolate stands out. Formerly made in numerous factories and even in private homes, which were visited by master chocolatiers, Compostela chocolate is normally used to make drinking chocolate. But there are more, always more, sweet things in grocer’s shops: jars of Galician honey of extraordinary quality (sometimes bottled with walnuts); “marron glacé” made in Ourense with chestnuts, or “mirabeles,” small plums originally from the Black Forest that have been grown in the south of Pontevedra for more than 70 years; they are sold fresh, in syrup or in liqueur. Another noteworthy feature here is the stylised bottles of Galician eau-de-vie, the only Spanish one with a Designation of Origin recognised by the European Union. The addition of some macerated herbs results in “aguardiente de hierbas,” which becomes a herb liqueur if it includes sugar, and “aguardiente tostado” if caramel is added. Coffee liqueur is produced by macerating coffee in eau-de-vie with sugar. We can also choose “licor de guindas” (with morello cherries), “mirabel” eau-de-vie and liqueur, coriander liqueur and eau-de-vie cream, similar to Irish cream liqueurs.